The National Chairman of the All Progressives Congress (APC), Adams Oshiomhole, has threatened to suspend erring ministers. Oshiomhole while addressing journalists at the Presidential Villa in Abuja, on Monday, said the APC will not give room for ‘dishonourable’ Ministers. He noted that discipline must be maintained. Referring to a minister who he said failed to constitute and inaugurate board members for Federal Agencies’ parastatals under his ministry, Oshiomhole threatened to suspend such minister from the ruling party. 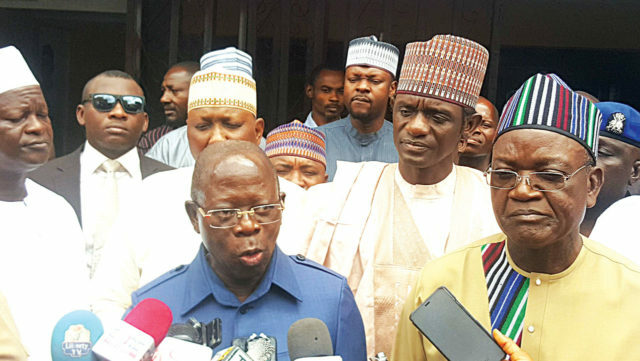 The APC National Chairman, Oshiomhole, said some Ministers have abused the ‘fatherly disposition’ of President Muhammadu Buhari and therefore, efforts will be put in place to prevail on the President to instill discipline in members of his cabinet and Ministers. Oshiomhole who became the APC Chairman during a period when the party is faced with internal crisis said he is not losing sleep over the Reformed All Progressives Congress (R-APC), a faction threatening to break away from the ruling party.